For other places with the same name, see Valencia (disambiguation). Valencia (València in Valencian) , pronounced /baˈlenθja/ (bahl-EHN-thee-ah) in Spanish, and /baˈlensia/ (val-ehn-see-ah) in Valencian, is a charming old city and the capital of the Old Kingdom of Valencia province of Spain that is well worth a visit. It is the third Spanish city in terms of importance and population, and the 15th in the European Union, with 810,064 inhabitants in the city proper and 1,832,270 in the Metropolitan Area (INE 2008). It is on the Mediterranean Sea approximately four hours to the south of Barcelona and three hours to the east of Madrid. Valencia is famous for its Fallas Festival in March, for being the birthplace of paella, for hosting the "2007 & 2010 America's Cup", and for the massive architectural project by Santiago Calatrava called The City of Arts and Sciences. The river Turia ran through the centre of the city, but it was redirected a while back and replaced by a beautiful park. This is a very nice place to spend any free time you have in the city on a sunny day. Valencia was host to the 2007 & 2010 America's Cup . 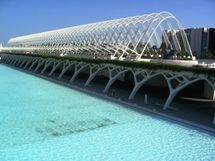 This fact, along with the construction of the "City of Arts and Science"  by renowned architect and Valencian Santiago Calatrava have made Valencia a city in transition. Massive construction and transformation over the last 10 years have turned a once little-considered medium city into a meatier and more interesting destination. Despite being on the Mediterranean Sea, even residents say that "Valencia has always lived with its back to the sea", meaning that the spirit and the core of the city is not necessarily integrated with its beach. The city center and the most visited neighborhoods are not particularly close to the beach. Valencia was founded by the Romans and was held by the Moors from the 8th to the 13th century (with a short interruption by El Cid). In 1609, the Moors who had converted to Catholicism were expelled from the city. During the Spanish civil war in the 1930s, Valencia was the capital of the Republic, which eventually lost to Franco's forces. Summer — Like most European countries, August is a slow month as many of the residents are on vacation. At this time of year Valencia is extremely hot and humid with temperatures averaging between 30-40°C (86—104°F). Autumn — September and October are more active months and the weather permits beach outings. Pavement cafes are still open until around the end of October. Winter — Though temperatures are still relatively mild, it's too cold to sunbathe at the beach. Spring — A lovely time to visit. The annual "Fallas de San José"  unofficially marks the beginning of spring. Cafes and restaurants open their terraces and life spills out onto the street once again. Valencia's official languages are Valencian/Catalan, and Spanish. In the capital of Valencia, which is the third largest city in Spain, not many people speak Valencian and are not offended if addressed in Spanish. However, outside the capital, Valencian is often preferred. As in Barcelona, with Catalan, it helps to be sensitive to this language dynamic. However, the linguistic issue is not as controversial as in Barcelona and most people in Valencia speak Spanish as their first and commonly, only language. You have some Spanish language schools in Valencia, for example "Lingua Valencia". English speaking skills of the locals can be hit or miss. Hardly anyone over 35 speaks English, and most would obviously prefer being addressed at first in Spanish or Valencian. French may be spoken or understood by some. Valencia Airport  (IATA: VLC) is 9 km from the city center. The bus (Metrobus) to Plaza de Espana departs every 25 minutes and takes about 30-40 minutes (€1.45). The bus stop is a bit hidden, only a small sign in front of the parking lot at the level of the arrivals. Metro  goes directly to the town centre and links the Airport to the main train station, Estación del Norte (beside Xàtiva metro stop), running every 8 minutes and taking about 20 minutes. The ticket card (TuiN card) itself costs €2, and the fare from Airport (zone D) to Xàtiva metro (Zone A) cost €3.90 as of April 2018 (you can save yourself some money by walking to the next station, Rosas, from where the centre can be reached for €2.10 because it is in zone B). You can buy the ticket card also at the airport with a minimum top up €10. A taxi ride form the airport to Calle de La Paz, which is in the heart of the historic city centre and covering a distance of approximately 11km costs around €19 with an additional 'airport supplement' of around €4. The tarifs are on display in the taxi in Valencian, Spanish and English but are difficult to see. The same journey back from Calle de La Paz to the airport half the price! These fees are accurate as of August 2008. Valencia is served by Iberia, Air Europa, Lufthansa, SAS Scandinavian Airlines, AirFrance, TuiFly, Ryanair, Transavia, Vueling, and several other airlines. The national train company is RENFE . The tickets can be booked online. The cheap tourist class tickets are often sold out, so economical travellers should book their tickets some couple of days in advance. Direct ferry routes exist between Valencia and Ibiza, Palma de Mallorca, and Mahon. For metro (subway and tram) and bus (EMT) transport it is possible to buy cards called bonos in kiosks and tobacco shops. These are used for 10 journeys. The cards are contactless, and can be topped up and changed to different types once empty. There are a few different cards, so make sure you get the right one for your trip. The Metro only paper tickets are sold at the metro ticket machines. For a plastic card that includes bus, you will need to buy at tobacconists, authorized kiosks, and Metro stations. Bonobus is €8.50 to top up on a refillable €2 PVP (plastic) card. Only for bus. Bonometro which costs €8.60 (June 2018) including €1 for refillable paper ticket for Zone A (not including the airport) and is available at the ticket machines in the underground stations. The metro card journeys are up to 50 minutes for a one zone card including transfers. Bono Travel is €9 top-up on a €2 PVP card and works on Bus and Metro. TuiN is a value card which you charge with €10 minimum for the metro. Each journey within one zone costs €0.72 (June 2018). The advantage is you can use this card outside of the zone at an additional cost but still at a reduced rate over a single ticket (like to get to the airport). Top up's are €10 minimum in €1 increments. The Bono and TuiN cards can be used by multiple people. There is the T1/T2/T3 unlimited 1, 2 and 3 day travel cards that include bus and metro for 4,00/6,70/9,70 € respectively (June 2018). Also a Valencia Tourist card which has unlimited travel and discounts to attractions. These cards are for only one person. Renting a bike is an increasingly popular way for visitors to explore this essentially flat city. Since 2010 the city offers public bicycle rentals at over 250 locations around the city (and growing). This service is called Valenbisi . For 14€ you get access to unlimited use of the bikes during 7 days, first half hour is free, then 1€ every 30 minutes extra. You can purchase the ticket at any terminal at the stations. If you stay longer than two weeks while using the bike system it might be smart to get the 365-days pass for around 25€. You need a credit card, internet and a metro ticket to get it. You can also let them mail it to your Valencian address, but that takes about 20 days. With the normal paper metro ticket you can online chose to book the Valenbisi on this very metroticket. You only need the ID-Number of the ticket. This will instantly grant you one year without the need of an address or the waiting. Lights at night and reflective clothes are mandatory, helmet is only recommended. Riding through the pavement is also forbidden and bikeways are not frequent, this can do riding a bike in Valencia not recommended if you're not used to deal with city traffic. Drivers usually are unkind to cyclists. Aside from going to the beach and the City of Arts and Sciences, exploring the hub of the city requires no public transportation. Much of this city can be done walking, stopping for a coffee or a beer, and then walking more, all very leisurely. It's not necessary to have the mindset of mastering a complex public transportation system. However, for longer trips, see below for some pointers. The Metro Valencia  consists of five lines (from which one is a tramway to the beach) and connects the suburbs with the city. As of Apr 2013, the one-way fare for one zone is €1.50. The ticket itself costs an additional €1 and contains a rechargeable chip. This metro system is not extensive, but can get you to major points within the city. If you want to take the tram, you have to buy a ticket from the machine, then validate it, before you get on. If you use the metro a lot, you should consider getting a TuiN, Bonometro (see above), or a one-, two- or three-day pass, which can be quite economical. For just over €22, you can ride for 72 hours on the metro and tram as much as you like during that time; a bonus is that if you buy a ticket at, for instance, 16:00 on a Monday, it will expire not on Wednesday night, but on 16:00 Thursday. Or a €10 TuiN pass will buy you 13+ journeys in one zone and the card can be shared among multiple people. Driving to Valencia from Barcelona, travellers take coastal route E-15. A long and scenic roadway, at many points directly adjacent to the water, the E-15 is a toll-road (costing 35 Euro to traverse its entire length). EMT  runs buses to virtually every part of the city. The Barri del Carme neighborhood is in the old center. It is the perfect place for a stroll where you can witness the transition from a forgotten area to an up-and-coming diverse neighborhood. Barri del Carme has many outdoor cafes and trendy shops. There is an interesting mix of people, from lifetime residents, to alternative types, hippies, gays and lesbians, and other assorted peoples. The neighborhood swells at night with revelers, but please respect the neighbors who live there. The La Lonja de la Seda (Silk Exchange) — This building is the site of the ancient local silk trade. It is also a UNESCO landmark and has recently been refurbished. Some of the gargoyles are quite naughty. Contrary to the wealth of material published by the tourism industry touting this to be the "best preserved late gothic/renaissance building in Spain", in fact only the interior of this building is original. The exterior was renovated in the neoclassical period (approx. 1879) and has been passed off as medieval by the tourism industry in an attempt not dissimilar to the controversial Barri Gotic quarter in Barcelona (which has since been proved to be mostly a medieval fake). Further restoration work in the mid-90's and again in 2007-2008 has clouded the authenticity of the exteriors decorative features. A visit to the Silk Exchange to see the beautiful interior vaulting should still be on everyone's itinerary in Valencia, but doubt claims as to the "Gothic-ness" of the miraculously preserved 500 year old stone carvings. The Mercat Central — Located in an aging "modernist" building in the process of being renovated. See how the locals shop for food and buy some fantastic fresh produce, meat, or olives. Walk along the old Tùria river bed, now a park with soccer and rugby fields, an artificial boating lake, athletics track, playgrounds, fountains, and trails. This massive elongated park spans many neighborhoods and ends at the City of Arts and Sciences. Abundant bike paths make it an ideal place to get in a little exercise and sun. Torres de Quart, at the end of Calle Quart. This pock-marked medieval tower was part of the ancient wall that surrounded the old city. Another set of nearby towers called the Torres de Serrano were also part of ancient wall. The Serrano towers have been massively renovated and somewhat modernized, but they are still interesting and are located across the street from the park. What are Fallas? The origins of the Fallas Festivity  goes back to an old tradition of the city's carpenters, who before the Festivity of their patron Saint Joseph, burned in front of their workshops, on the streets and public squares, their useless things and other wooden utensils they used to hold the candles that gave them light during the winter season. This is the reason why the night of the cremà (in which the Fallas monuments burn down) is always on March 19th, the Festivity of San José. In the 18th century, Fallas used to be piles of combustible materials that were called "Fallas" and were burnt the night before the day of San José. These Fallas evolved and acquired a more critical and ironic sense when showing in the monuments reprehensible social scenes. Around 1870, the Fallas celebration  was forbidden, as well as Carnival. In 1885 this pressure created a movement that defended typical traditions by awarding in the magazine "LaTraca" the prizes to the best Fallas Monuments. 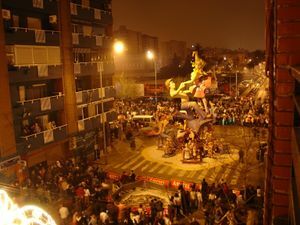 This competition, which began to be popular among different neighbourhoods, brought the creation of the artistic Falla, where critique was still an important element together with aesthetics. 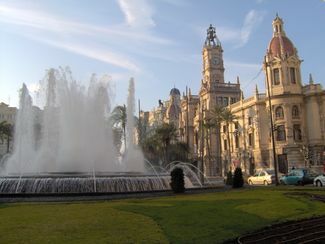 In 1901 the Ayuntamiento de Valencia awarded local prizes to the best Fallas. This was the beginning of the union between the people and the political power. This relationship has greatly developed this popular festivity in its structure, organisation and size. In 1929 the first poster contest for the promotion of the Festivities and in 1932 the Fallero weekend was established. It what then, when Fallas became the Mayor Festivity of the Region of Valencia. Today, more than seven hundred big and small Fallas are burned in the city of Valencia. Valencia has a fantastic festival each March called Fallas , in which local areas build big papier maché models. They are mostly of a satirical nature and can be as tall as a few stories. Fallas are constructed of smaller figures called ninots, Valencian for "dolls". The fallas take a whole year of planning and construction to complete. Each neighborhood has a falla, but 14 fall into the Sección Especial category and these are the most important, expensive, and impressive. Each falla has an adult falla (mayor) and a kid's falla (infantil). It is best to arrive by 16 March, as all of the fallas are required to be finished or they face disqualification. Another feature of Fallas is the fireworks. It's like the city's a war zone for a week! They wake you up early in the morning and go on through the day. Every day, there are three fireworks events, la despertà, la mascletà, and el castillo. La despertà occurs every morning at 8AM in order to wake you up. At 2PM in the main square of the city, the Plaza del Ayuntamiento, there's a thing they call Mascletá. This is 120 kilos of gunpowder translated into a lot of noise. It has to be experienced to be understood. This is very popular and you should arrive an hour in advance at least. Every night between midnight and 1AM, there is a castillo, a fireworks display. The last night it's called la nit de foc, the night of fire, and this is the most impressive. This is also very crowded and you need to arrive early to be able to see it. Along with these displays, people set off fireworks all day, making it very difficult to catch any sleep. The days of 17th and 18th of March is La Ofrenda. The falleras from each falla take flowers to the Plaza of the Virgin. These flowers are used to construct the virgin. The processions are grand and very beautiful and worth catching. They follow two main paths: one down calle San Vicente and the other down Calle de Colon. At the end of a week displaying the 'fallas' they are burnt. This is called la cremà. The fallas infantiles are burned at 10PM and the fallas mayores are burned anywhere from midnight to 1AM. The one at the town halls is burned last at 1AM. The most impressive to see are the fallas in Sección Especial, because these are the largest and most dramatic when they burn. These tend to be very crowded and one should arrive early. Go around and see the various fallas, but especially the Sección Especial. Pay to enter one of the bigger fallas to get a closer look at the individual ninots. See la mascletà and the la nit de foc. See one of the various parades, especially the ofrenda. See the virgin made of flowers. Buy churros or buñelos at one of the many stands on the street. Go to one of the temporary bar/nightclubs set up on the street and dance all night long. Most of the streets in the city are closed to everything, except pedestrian traffic and it is difficult to get around. The best way to get around is either by walking or taking the public transportation. Driving a car is not a good idea. Most of the restaurants are very crowded and some are not open. There is usually very long waits and slow service and you should plan for this in your schedule. Most of the hotels are also very crowded and should be booked in advance. Many people throw fireworks near pedestrians and its very easy to get burnt or injured. Some of the fallas, like Nou Campanar, are well outside the city center and are quite far by foot, it is much easier to take a bus. Playa de Malvarrosa and Playa e Levante o de la arenas are the most popular city beaches, just north of the port. To get there, take the metro or tram to Eugenia Vines or Arenas station, or take the metro to Maritim Serreria and continue with the tram to Neptu (all on one ticket). El Saler is the nicest and best developed beach near Valencia. Devesa is undeveloped and has nice surroundings. At Devesa and Playa Pinedo there are nudist sections. These beaches are located south of the port. To reach them, take the Yellow Bus (operated by "Herca") from Calle Alicante near the train station, in direction "Perello". The trip takes about 30 minutes; the bus runs hourly 7am - 9pm. The Fuente de Los Baños hot spring is located 90km north of Valencia in in the town of Montanejos. The crystalline waters of the lagoon bubble up from the earth at a temperature of 25ºc all year round. This place well known by the locals is still undiscovered by most travelers. The story goes that the hot spring was the preferred bathing and relaxation site for a Moorish king´s harem. The water was said to keep his women young and beautiful. Dip into the water for a swim and explore the lagoon snorkeling, see the fish around you and discover the hidden caves. For the brave, there´s the option to jump off cliffs right into the deepest part of the lagoon. New Languages  is like the young, dynamic alternative to the big institutions. Private (one to one) classes mean you can basically start any time and choose when you want your lessons. This and the plenty of young people around make it quite suitable for travellers. Tel: +34 963 94 34 94, email: [email protected], address: Calle Luis Vives 7, 46003 Valencia (near Plaza de la Reina in town). Don Quijote  Spanish school in Valencia is a great school where you can take 4-6 hours of courses a day. All courses including beginner courses are taught entirely in Spanish. Linguaschools Valencia  organizes Spanish courses for foreigners, using the immersion method. The school is based in a real Spanish villa, located next to the Universidad de Valencia, close to the old town of Valencia. Here, you can enjoy your classes, lounge on one of the terraces or study in the garden. Espanole Ih Valencia  is a member of International House, a network of language schools all over the world. The school provides the students with lots of leisure time* activities and even housing can be arranged by the school, either in a studio, in a shared apartment or in a guest family. Even the beginner courses are taught entirely in Spanish, which makes it difficult to follow the lessons in the beginning. The school is centrally located at Calle La Nave 22. 2Day Languages 2Day Languages is a new modern language school. It is located in the center of Valencia in one of the most beautiful avenues of Valencia with plenty of palm trees.Our Spanish courses are adapted to the Common European Framework of Reference of Foreign Languages (CEF), which means that we have 6 different levels: from A1 (beginner) to C2 (proficient). Our Language School is located in Avenieda Renio de Valencia 15 , puerta 3. Patriarca Square (Plaza del Patriarca) is a good place to look for the major national brands like Loewe, LLadró, Louis Vuitton, Dolores, Farrutx, etc. To recognize "real" local paella from tourist junk, avoid any places with large paella pictures on the door step. This is a sure sign for frozen/microwaved paella. When possible, make reservations or arrive early (no later than 2PM), especially on Sunday, because these restaurants fill up quite quickly on the weekend. Paella is typically eaten at mid-day (between 2-5PM), so many restaurants do not serve it at dinner. Be careful of those that do as this is not the custom here and the quality of the paella may be poor. The paella pan is of a size that almost all restaurants require a minimum of two servings for an order. Restaurants that allow ordering one order are likely serving frozen paella. Local paella — There are several versions of this tasteful rice dish: Paella Valenciana, with meat (chicken and/or rabbit usually), Paella de Marisco, with fish or seafood, or even Paella Mixta, with meat and fish at the same time, the least popular amongst locals. It is very difficult to say which is the "real" paella, as every person has his/her own version (Though NO paella that deserves this name contains sausage, ham or meat broth, for instance). If you want to eat an authentic Paella, try it at the Malvarrosa beach area; you will find there are several good restaurants. The authentic Valencian Paella is made only with fresh ingredients, in a special iron pan and using a fire made with wood (not gas or electricity). Vegetarian Paella is called "Paella vegetal" or "Paella de verduras". Arròs a banda and arròs negre — This rice is black because it contains squid ink. You can find these dishes at the same places as above. Fideuà, a paella-like dish, with short noodles and fish, was invented in the Gandía and Denia area (Alicante) and can be usually found in paella restaurants. It deserves a try too. All i pebre — All i pebre is made of eel, a snake like fish typical from the Albufera, a lagoon near Valencia. You can drive to El Palmar and taste it there. Delicious, but a very special taste. You can find good paella, and other traditional dishes at the restaurants here too. Salted fish "salaons": tuna ("moixama", "tonyina de sorra"), cod ("bacallà"), roe, anchovies, capellans are very popular delicatessen. Also dried octopus. Check them at the local markets, like Mercat Central de Valencia. Large choice of pickles such as olives, tomatoes, onion in brine. Great with tomatoes and olive oil. Check out on local varieties of vegetables such as tomatoes, cucumbers, peppers, onions, aubergines etc. Also season fruit, probably varieties you don't see at home. Llet merengada — A kind of milk-based soft ice cream with a cinnamon-lemon taste. Bunyols — Fried doughnuts, sometimes round shaped, sometimes like rings. Widely available only during March. Dip them in hot chocolate. Sometimes they are too oily, so don't eat a lot of them or you will not be hungry again for several hours. If you can choose the 'carabasa' (pumpkin) version, you should try it. They are generally tastier. Barrio del Carmen is a major nightlife destination in Valencia. There are numerous restaurants, bars, and dance joints, which tend to cater to a youngish crowd, in particular along Calle Caballeros. Calcata — This is a slightly upscale, younger crowd nightclub in a beautifully renovated old building. Weekends from midnight. Entry €10 includes a drink. Blau — This is a newer bar on Calle Alta in Barri del Carme that plays groovy music and has a good mix of people. Ruzafa This neighbourhood close to the city center has recently emerged as the hippest nightlife area in town, offering a wide variety of restaurants, pubs and clubs, mostly aimed at the most modern crowd. Plaza del Cedro is a nice place where all possibilities are given to spend a night partly o complete in less touristic ambiance than in the center. A lot of Bodegas and Tapas bars where you can get typical Spanish dinner for quite good prices. When you arrive early (the Spanish early) at about 8PM they are usually having special offers like "Tercio y Tapa" for about €1. To find them orientate more to the parallel streets to Carrer de Doctor Manuel Candela. Later to drink something occupying the time between dinner and going out there are many bars with different kind of music present. Additionally there is typical Spanish nigh-life feeling on the Plaza del Cedro itself. Different kind of people enjoying the mild Mediterranean clime to sit outside talking, drinking and playing guitar often until the sunrise. Other centres of are night-life are Cánovas (more up scale), Juan Llorens (young also, less "alternative"), around the university (students), and increasingly in the area near the beach and port. Wine lovers may want to explore the wineries of the Valencia wine region , including Bodega El Angosto, Bodegas Los Frailes, and Bodegas Murviedro. Agua de Valencia — Valencia water is a very famous mixed drink. There are several recipes, mainly based on a mix of orange juice and Cava, the local sparkling wine. Orxata — A drink made from tiger nut (Cyperus esculentus), xufa in Valencian or chufa in Spanish. Being cold and sweet, it is specially popular during the summer months. In Spanish it is called 'horchata' and it can be found in 'horchaterias' or 'orxateries', but also in most of the cafes and bars. When ordering a horchata, you will most probably be asked whether you would like to have a 'farton', a small pastry for being dipped in horchata, as well. Cibada — An iced malt drink. Llima Granizada — Iced lemonade. Café del Temps — Espresso on ice. Blanc i Negre — Iced coffee with leche merengada. Calimocho - A popular drink, originating in the Basque Country, made with red wine and cola mixed. Staying in or near Old Town means you will hardly need transport, unless you go to the beach. Expo Hotel Valencia, Avda. Pío XII, 4, (34) 96 303 36 00. An ideal location situated within the Nuevo Centro. Offering 3* surroundings, great service and with a private swimming pool, it's a perfect base for business or pleasure visits. NH Villacarlos Address: Avenida del Puerto, 60, 46023, Email: [email protected], Tel. : +34 96 3375025, Fax: +34 96 3375074 . The hotel is within walking distance of the historic centre and the commercial heart of the city, as well as La Ciudad de las Artes y las Ciencias, the Valencia football stadium Mestalla and the Palau de la Música. There are a few other NH hotels in Valencia  if this one doesn't take your fancy. Internet terminals for 2 Euros/hour can be found at the main tourist information on the east side of the Plaza de la Reina in front of the cathedral, and at the cyber cafe in the Calle de Cerrajeros. 1 Euro/hour in the Chinese places in Calle de Pelayo, west of the train station. McDonalds on the Plaza de la Reina as well as many other restaurants and cafes offer free WiFi. Saler — These beaches are on "protected" land and are the cleanest, most secluded beaches within easy reach of the city. Accessible by bus, but that requires a good level of organization. A round-trip taxi ride should cost between €10-20, depending on how far along the beach you go. Manises, 15 km south west of Valencia. It is not only the site of Valencia's airport, but also an important center for pottery. Some 100 ceramics factories are located in the municipality, where the art has been practiced for at least 700 years. At the MCM Museum, there are exhibitions about the history of ceramics in the area. La Tomatina, hosted by nearby Buñol on the last Wednesday of August. A festival that involves thousands of participants throwing ripe tomatoes at each other. Make sure you wear clothes that you can throw out afterwards, as it gets very messy. Rent a car and do a day trip to any number of picturesque villages or small cities in the region, including Chulilla, Sot de Chera, Xátiva, Sagunto, among others. Hot Spring and other discoveries: A small tour company (Hot Spring Day Tour) offers rides and guided visits to off-the-beaten-path destinations around Valencia. The most popular tour is an incredible hot Spring natural pool in a canyon, 90km of Valencia. Access by public transportation is difficult. Cuenca: Its 200km from Valencia with houses which looks like hanging from the hill. It is a city in the autonomous community of Castile–La Mancha in central Spain. It is the capital of the province of Cuenca. This page was last edited on 31 October 2018, at 14:56.